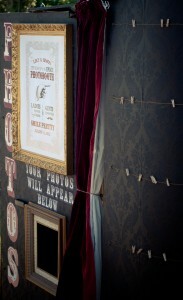 We have three vintage themed photobooths for your delectable pleasure. 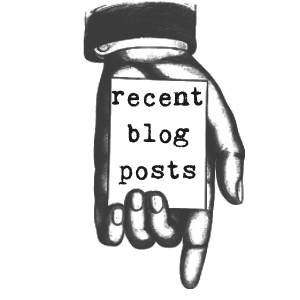 Each booth provides professional photographic images that are printed within 20 seconds of you having pouted in front of the camera. 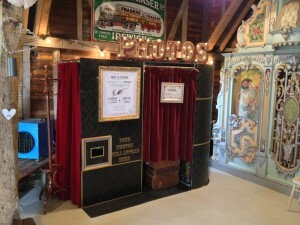 The booths allow you the option to have a number of photobooth image layouts (see here for more details) and a choice of colour, black and white or sepia images (chosen by you and your guests at the time of taking your images). 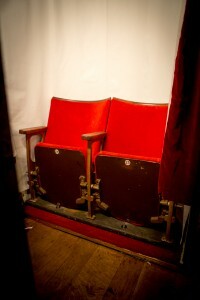 Which vintage booth will you choose? 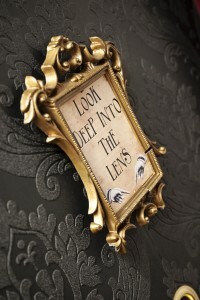 Inspired by one of the most beautiful eras in modern memory, our Art-Deco enclosed booth captivates a time when image was everything. 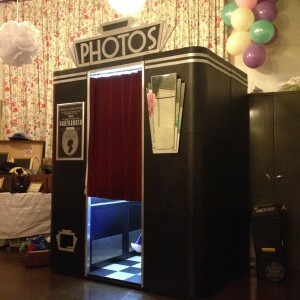 A must for any Great Gatsby, prohibition style event, this booth never fails to impress and sits perfectly in any location. 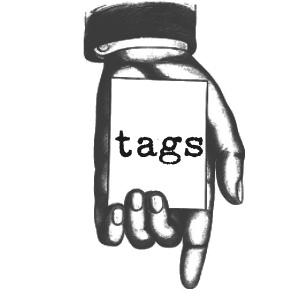 The booth comes with a personalised A3 poster created by our in-house designer and also has the option of video-boothing should you require it (further costs apply for this option). 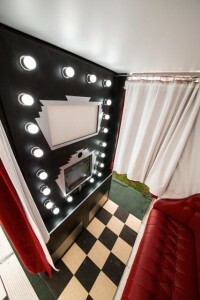 Vintage themed music will fill your ears as you sit atop the soft red leather Art-Deco inspired booth seat and decide upon your best booth poses. 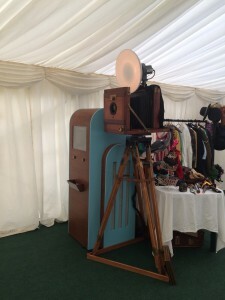 Swathed in vintage style, luxuriously elegant red velvet curtains and authentic 1940s cinema seats, the vintage wonder that is The Churchill Vintage enclosed booth is everything you want from a vintage-themed photobooth. 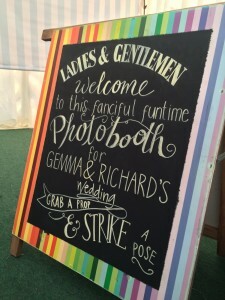 The brightly lit ‘PHOTOS’ sign atop the booth and bespoke A1 poster created just for your wedding, event or party, all add that perfect vintage elegance to your evening. 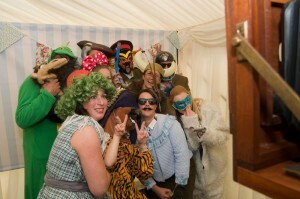 Our open-air studio booth offers a creative, bespoke option to your wedding, event or party. 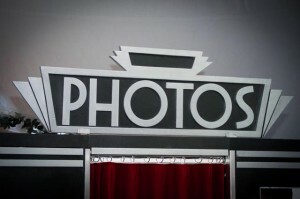 Allowing up to 8 people in front of the camera and with the option of a personalised, bespoke backdrop, it will give your event a truly personal touch. 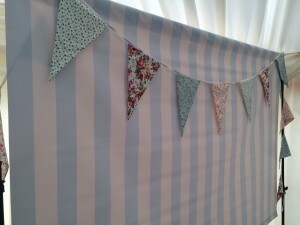 Currently, the blue and white striped back drop with vintage, floral bunting creates the perfect vintagey-feel for you and your guests; but with many a back drop idea in the pipeline, we will be creating even more vintage themed back drops to hire. 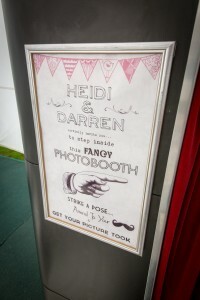 Should you require something specific, please email us at enquiries@thevintagephotoboothcompany.co.uk to discuss this further.